In response to the invitations from University of Jyväskylä in Finland, University of Essex and the Coventry University in the UK, vice president Xiaoli Liu led JUFE delegations to Finland and the UK during 17th to 23rd June. 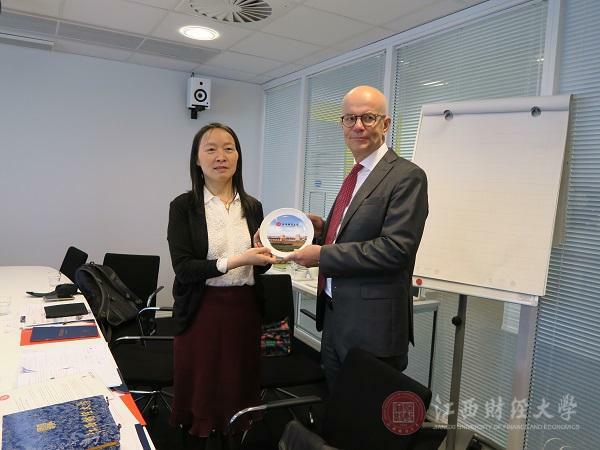 Xiaobing Mao, Dean of School of Information Technology; Jinglin Xia, Coordinator from office of International Cooperation and Exchange also travelled with the delegation. University of Jyväskylä (JYU) is one of JUFE’s newly developed partner universities in 2018. It is one of the largest comprehensive higher education institutions in Finland. Like other Finnish universities, it is a national university governed by Ministry of Education in Finland. Vice president Liu and the delegations have met with Prof. Pasi Tyrväinen, Dean of School of Information Technology, Prof. Mikko Siponen, Associate Dean of School of Information Technology, Prof. Timo Tiihonen, Vice director of International Education and Collaboration in School of Information Technology, and Niina Ormshaw, International Coordinator. Both parties introduced the underlying circumstances and needs for further development of both universities to each other. Then, they met with the Vice-president Prof. Henrik Kunttu to sign the Memorandum of Understanding between JUFE and JYU. When it comes to the foundation history, design of majors and curriculums, and concepts and ideas of education, The School of Information Management in JYU and School of Information Technology in JUFE match perfectly. Both sides discussed for details in the collaboration agreements for “4+0” Sino-foreign undergraduate cooperation projectin information management and information systems. JYU also proposed for summer school in Finland, PhD joint cultivation, and scholars recommendation to enhance our cooperation. JUFE welcomes and encourages renowned professors and scholars to visit JUFE , give lectures and do joint researches. Undergraduate and PhD education in Finland are free of tuition charges, post-graduate education charges for tuition but offers abundant scholarships in most cases. So that entirely facilitate students to pursue their academic career. Xiaoli Liu and the delegations also visited the university libraries, laboratories, teaching buildings and other infrastructures in JYU. They are deeply impressed by the user-friendly, meticulous and environment-friendly Finnish design. She pointed out that JUFE should learn such advanced design concepts in the development of infrastructures like libraries and museum and provided more convenient and comfortable study and living conditions for our staff and students. During the visit to Essex University in the UK, the delegations met with the JUFE students that are staying in Essex currently. They have achieved outstanding academic performance. With the support and recommendation from Essex Staff, they gained good opportunities to study masters or doctoral programmes in top universities in the world. During the meeting with Dr. Geoffrey Wood, Dean of Business School, Dr. Alex Kontonikas, professor in the Business School, Dr. Katharine Rockett, professor in Economics, Dr. Marco Francesconi, professor in Economics, and Dr. Carmine Ventre, professor in Computer Science and Electronic Engineering, Essex actively promoted BSc Finance with Mandarin and BSc Management with Mandarin to JUFE. Vice president Liu also briefly introduced various kinds of scholarships that Chinese government and JUFE could provided for international students and expressed warm welcome to Essex students. They also actively talked over with Dean Mao about multidiscipline graduate programmes and encouraged JUFE students from different academic backgrounds to join in. Liu indicated that students from School of Information Technology in JUFE have excellent mathematical background. That can be a good chance for more students to further their study overseas. Delegation were impressed by the libraries and Business School Buildings in University of Essex. They indicated that there are many advantages in frustrature design that JUFE could learn. During the visit to Coventry University, Vice president Liu met with David Pilsbury, Vice President of Coventry University and the UK Dean of the JUFE-Coventry Confucius Institute (CI), Judy Finlay, Head of East Asian Strategic Cooperation, Mathew Beedham, Vice Dean of School of Humanities and Social Sciences, UK Vice Dean of the CI, Xifeng Zhang, Chinese Dean of the CI, as well as Furong Furong, Chunjiao Ying, JUFE staff that are currently working at the CI, and Wenzhu Cai, JUFE visiting scholar in Coventry. JUFE and Coventry have cooperated for many years and have carried out various student exchange programmes, including including 2+2 dual bachelor degrees, 3+1 dual bachelor degrees, 1+1+1 dual master degrees, CSC sponsored undergraduate visiting programmes, and so on. There have been firm academic communications between the two universities for years, and a CI was co-founded in recent years. Vice President Liu and the delegations learned in details about the teaching operations, capital use and auditing in the CI in Coventry. The JUFE-Coventry CI have carried various projects and achieved fruitful results. These gained good impacts in Coventry City, the surrounding area and other CI in the UK. Coventry University representatives and JUFE delegations highly praised the JUFE staffs and faculties working in CI in Coventry. Afterwards, the delegations met with Dr. Damien Foster, Faye Mitchell、Craig Stewart and Rochelle Sassman from School of Computer and Electronic Mathematics. The representatives discussed about cooperation in information technology management. The delegation also visited John Blundell, Lord of Mayor in Coventry City and John Norton and Ben Yorke, officials in the city council, reached a consensus on economic and trade cooperations and cultural exchange between the two cities. This was a fruitful visit. The delegations not only signed cooperation agreements, reached consensus on specific cooperation projects, but also strenthened the friendship between the two universities, deepened mutual understanding, and developed the path for further educational cooperation and student exchanges with JUFE and universities in the UK and Finland.